The Lancaster Craft Beerfest will take over the 100 block of N. Queen St. on August 27th. Our beer steins are ready. The Lancaster Craft Beerfest will take over the 100 block of North Queen Street on Saturday, Aug. 27. More than 70 breweries will be spread across Binns Park and Lancaster Square, in addition to a slew of food trucks. Now in its fourth year, the Lancaster Craft Beerfest is more popular than ever. More breweries will be represented than in previous years, and VIP tickets sold out quickly. Christopher Trendler, one of the beerfest's organizers, said, "It's a really fun party for the day. It's in the middle of the day, in the middle of Lancaster." Along with Trendler, organizers Jonathan Yeager and Adam Ozimek work to make the event better every year. In addition to dozens of returning breweries, 27 breweries will be new to the beer festival this year. VIPs will have exclusive access to certain beers and breweries. Colorado's New Belgium Brewing, Oregon's Deschutes Brewery, and California's Ballast Point Brewing are a few of the out-of-town breweries that will have stands at Lancaster Craft Beerfest. 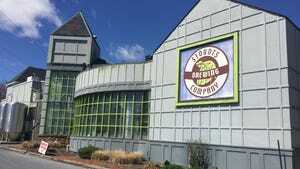 "There are some great breweries out there that we want to show the local population," Trendler said. Plenty of local breweries will be in attendance too, including Stoudts Brewing Co., Spring House Brewing Co., Wacker Brewing Co. and Mad Chef Craft Brewing. Philadelphia's Yards Brewing Co. is this year's mug sponsor. Yards will not only have three tables at the Lancaster Craft Beerfest but will also bring every beer they have. Why is the craft beer industry exploding in Pennsylvania, particularly in Lancaster? "Lancaster has had a rich history in brewing," Trendler explains. "There's such an emphasis on supporting local [businesses]. We live in a great area for agriculture. Why not support the local scene?" Seasoned beer drinkers will enjoy tasting new beers and limited series beers. Be sure to chat with whomever is dispensing your beer, if you're interested in expanding your palate. The breweries encourage communication and are happy to make recommendations, Trendler says. On the other hand, newbies shouldn't be intimidated by the vast selection of beers on hand. The Lancaster Craft Beerfest welcomes new attendees. Trendler says, "We're trying to make sure there's going to be something you're going to like." In addition to all the beer, patrons can also drink hard cider and hard soda. Plus, several food trucks will line North Queen Street, including Lancaster Brgr Co., The Cow and the Curd, Souvlaki Boys, and Splits & Giggles. The end of August has turned out to be the sweet spot for hosting the Lancaster Craft Beerfest. Trendler explains that having the festival at the end of summer means that breweries have their summer seasonal beers and their fall seasonal beers on tap. "It bridges summer seasonals to fall seasonals," Trendler says. "We have all of that." Different beerfests have different set-ups, using tokens or tickets or bracelets, and having different limits to how much patrons can drink. Trendler says, "We discussed a lot of different set-ups. We did what's right for the area. It's interesting and educational." One of the ways the organizers improved attendee experience is by making it easier and faster to get into the beerfest. After a lengthy admission time in the first year, Trendler says they added an additional entrance gate. The organizers also kept the number of attendees to 3,200, in order to lessen the lines at each brewery table. The Lancaster Craft Beerfest is a great way to end the summer and to celebrate Lancaster living. Trendler says, "There's something for everyone." Tickets: Must be purchased online at [http://lancastercraftbeerfest.com/tickets/] lancastercraftbeerfest.com. $40 for general admission. $12 for designated driver. Parking: Available in [http://www.lancasterparkingauthority.com/] public parking garages located on North Queen Street, North Duke Street, Prince Street and East King Street.